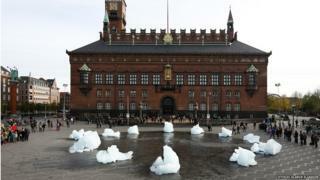 Scientists and officials are meeting in Denmark to edit what's been termed the "most important document" on climate change. The IPCC Synthesis Report will summarise the causes and impacts of - and solutions to - rising temperatures. It will be the bedrock of talks on a new global climate deal. But there are concerns that political battles could neuter the final summary. Over the past 13 months, the IPCC has released three major reports on the physical science, the impacts and the potential methods of dealing with climate change. "The new thing is there is going to be a stand-alone document that will be the most important for policymakers for the next few years," Prof Arthur Petersen, a UCL researcher and member of the Dutch government's team at the Copenhagen meeting, told BBC News. "It will be the document for the Paris summit." The UN hopes to deliver a new global treaty on climate change at a meeting in the French capital at the end of 2015. The IPCC Synthesis Report will, in the eyes of many, play a critical role in that. "It is the last word that science will have in this process," said Alden Meyer from the Union of Concerned Scientists, who is also attending the Copenhagen meeting as an observer. "So it is important that they get it right and make it as relevant to policymakers as possible." A draft of the report, seen by the BBC, underlines once again the near certainty of scientists about warming and man's role in it. Continued emissions of greenhouse gases, it warns, increase "the likelihood of severe, pervasive and irreversible impacts for people and ecosystems". The authors reiterate that each of the last three decades has been successively warmer at the Earth's surface than any preceding decade since 1850. The period between 1983 and 2012 was very likely the warmest 30-year period of the last 800 years, according to the draft. During this meeting the scientists and government officials will engage in a word-by-word review of the Summary, a document about 30 pages in length. Concerns have been raised about the role of the government representatives here in Copenhagen. There have been worries that they are trying to steer the science in a certain direction, to reflect their negotiating positions in the UN climate talks. One insider told BBC News that the chair of the IPCC, Dr Rajendra Pachauri, had to remind the delegates at one point that they were working on a summary for policymakers, not by them. In this series of reports, the IPCC introduced, for the first time, the concept of a "carbon budget". They worked out the amount of greenhouse gases that the world could emit to raise global temperatures by no more than 2 degrees C above pre-industrial levels. In Working Group III, issued in Berlin in April, they reported that two-thirds of that budget had been used up by 2011. But attempts to include this idea in the Synthesis Report have faced considerable opposition from political representatives from a number of countries, including India and the USA. India sees coal as playing a big part in attempts to get people out of poverty. A global limit on emissions, they argue, would interfere with that. "It would mean many of the development programmes would need to be curtailed, if carbon budgets put an embargo on providing basic necessities to people, that would be a big concern for India," said Sanjay Vashist from the campaign group Climate Action Network. Another point of contention between the developed and developing world is the question of responsibility and impact. Essentially poorer nations would like the language of the document to reflect the fact that they didn't cause this problem but they will suffer the most from rising temperatures. "We are not all facing the same situation," according to Sanjay Vashist. "The IPCC has already predicted above 2 degrees C for South Asia, that means the disasters will be more threatening compared to other regions. "Even if you tweak the scientific findings, it doesn't change that reality and the reality is we are facing a bleak future in absence of any ambition on mitigation and that needs to be addressed." There is some sense that the voices of developing countries have been getting stronger over the past 13 months as the IPCC has worked through the three reports. According to Arthur Petersen of the Dutch government's team, that's a good thing. "It gives strong signals to the scientific community that the whole development perspective is still a blind spot for the more modelling oriented people - do they really have a feel for what's going on in those countries? "But there is still a general sense and feeling that we should be able to reach an agreement where scientists and governments are happy - we can pull off the miracle again!"